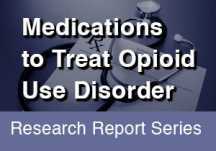 Home » Publications » Research Reports » Medications to Treat Opioid Use Disorder » How do medications to treat opioid use disorder work? Studies show that people with opioid use disorder who follow detoxification with complete abstinence are very likely to relapse, or return to using the drug.10 While relapse is a normal step on the path to recovery, it can also be life threatening, raising the risk for a fatal overdose.11 Thus, an important way to support recovery from heroin or prescription opioid use disorder is to maintain abstinence from those drugs. Someone in recovery can also use medications that reduce the negative effects of withdrawal and cravings without producing the euphoria that the original drug of abuse caused. For example, the FDA recently approved lofexidine, a non-opioid medicine designed to reduce opioid withdrawal symptoms. Methadone and buprenorphine are other medications approved for this purpose. Naltrexone is an opioid antagonist, which means that it works by blocking the activation of opioid receptors. Instead of controlling withdrawal and cravings, it treats opioid use disorder by preventing any opioid drug from producing rewarding effects such as euphoria. Its use for ongoing opioid use disorder treatment has been somewhat limited because of poor adherence and tolerability by patients. However, in 2010, an injectable, long-acting form of naltrexone (Vivitrol®), originally approved for treating alcohol use disorder, was FDA-approved for treating opioid use disorder. Because its effects last for weeks, Vivitrol® is a good option for patients who do not have ready access to health care or who struggle with taking their medications regularly. Because each medication works differently, a treatment provider should decide on the optimal medication in consultation with the individual patient and should consider the patient’s unique history and circumstances.